Being friends with an ex can be a double-edged sword. You may be telling yourself “it is okay to be friends because there is no bad blood”, but what are you really gaining from it? 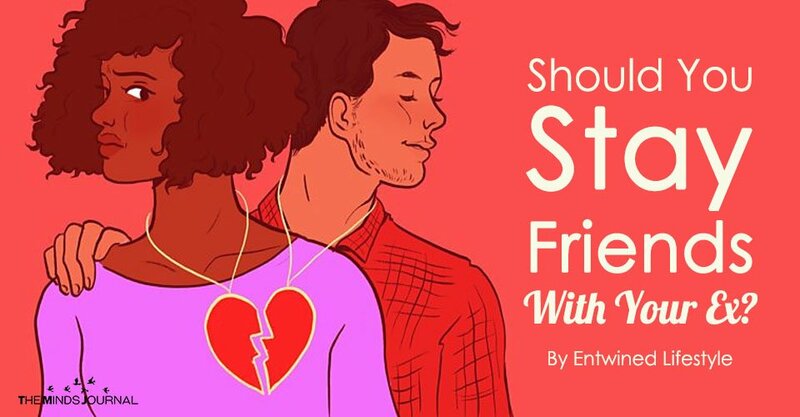 And, if you are only keeping the connection open because you still have lingering thoughts about rekindling the relationship, then being friends with him will do the complete opposite. He will think you can be is on-again and off-again fling whenever he wants you in his life. It sets the tone for zero relationship standards, showing him you are not worthy of a loving and fulfilling relationship. And if you are the type of woman who wants a committed relationship, not just a fling, then you may be holding yourself back from forming a healthy attachment with a new guy by keeping the ex in the picture. Especially, if you still get butterflies when your ex’s nickname pops up on your phone. His constant flow of text messages leaves you wondering what he will say next or if he is coming back. This is putting your energy towards him, not you. And if the chemistry was hot then, it definitely hasn’t disappeared. Chemistry rarely changes. So, are you wanting to just be friends or are you only trying to keep tabs on him so he can’t move on? Staying friends with an ex will definitely hold you back from your own relationship goals. And, it is highly unlikely he is going to be the one introducing you to your next boyfriend. 1. Does the relationship spell toxicity? If you and your ex experienced any kind of abuse or manipulative interactions throughout the relationship, then being friends will not be healthy either. Once a connection is toxic, it can be very challenging to reverse the toxicity without the help of an expert. And if the relationship is over because of this, then being friends is out of the question. Assuming that you find the lines to be blurred between on what is considered to be emotional abuse, then ask yourself how you feel after you talk to him. Does he affect your relationships with your friends or co-workers? Do you find yourself being more irritable or anxious? Are you secluding yourself from social interactions? Do you think poorly of yourself? Are you avoiding dating because you’re afraid he will find out? Being able to decide if it was a healthy or unhealthy relationship will determine if it is a good idea to be friends with him or not. Because keeping anyone toxic in your life will only bleed into your personal life and affect your decision making and well-being. 2. Is it affecting your new love life? If being friends with your ex is preventing you from moving on in your love life then you are setting yourself for another heartbreak. Being at a standstill or in a state of confusion will hinder your ability in attracting a new love connection. It can be extremely challenging to take interest in a new guy if you are busy comparing him to your ex. If you expect every new guy you meet to be just like him, you will continue to stay detached from any high-value man who wants to have a loving relationship with you. Keeping yourself closed off emotionally, mentally, and physically will put a hold on your love life. Talking to an ex is like dead weight. It’s better to leave the past in the past, find your worth, and attract the exact man who will respect and value you like the queen you are. Because if you are still thinking about the past, it will be hard to focus on the present. Jan Yuhas and Jillian Yuhas, MA, MFT, CPC work with individuals and couples to design a love life they deserve. As Love and Lifestyle Coaches, they offer Love Coaching for Men and Women who are looking to attract the love of their life, Couples Coaching for couples looking to improve their intimacy and connection throughout their relationship, and Life Coaching to individuals who are seeking lifestyle balance between the three main tasks of life: love, work and social.Their areas of expertise include dating etiquette, charisma and confidence building, communication techniques, self-love and self-acceptance growth, personal image consulting, boundary setting, conflict resolution, and lifestyle balance between the three main tasks of life-love, work and social.